Smart pot new fabric raised bed - a size for every situation. Smart pot long bede in 6 ft, 8 ft and 12 ft long with 16 inches wide and tall. Inserts placed internally in bed aid in keeping raised beds upright. Perfect for large garden installations no construction required. Air prunes, discourages ground pets, just unfold and plant! soil volume: 6 ft - 10.7,8 ft - 14.2 and 12 ft - 21.4 cubic ft. Growing area: 6 ft - 8 sq ft, 8 ft - 10.7 sq ft and 12 ft - 16 sq ft. If you have any questions about this product by Smart Pot Big Bag Raised Bed Long, contact us by completing and submitting the form below. If you are looking for a specif part number, please include it with your message. 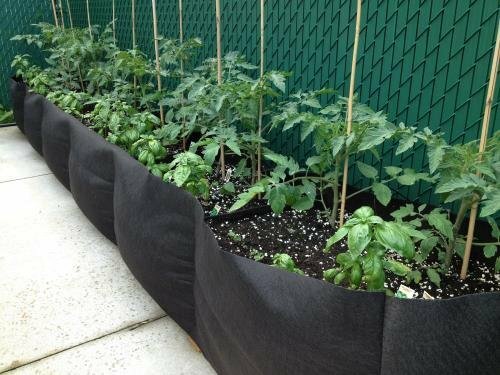 Susquehanna Elevated Garden Bed, Espresso, 32" x 32" x 16"
Raised Planter Garden Bed Bag, Felt Fabric Raised Garden Bed Rectangle Planter for Herb Flower Vegetable Plants Dia 36"